May | 2012 | Beer Apprentice - Craft Beer News, Reviews, Interviews and Info. What’s up guys? For today’s craft beer review I’m going to having the Bell’s Pale Ale produced by Bell’s Brewery, Inc. located in Kalamazoo, Michigan. No introduction needed for Bell’s, so let’s get to the website, bellsbeer.com, and see what the commercial description has to say about the Pale Ale. Pale Ale stands apart from the model of completely hop-dominated pale ales, offering a noticeable degree of malt body to counter the hop bitterness. A blend of floral & herbal hop notes provide the aromatic & flavor highlights, alongside the distinctive contribution of our house ale yeast. A crisp bitterness finishes the experience without being harsh. This beer has an ABV of 5.2% and it comes in a 12 oz. bottle. It poured a very hazy, orangish/yellow color with quite a bit of sediment present throughout. The cap was small, soapy and white. The retention time was weak and the lacing was thin and insignificant. The brew smelled of toasted biscuits and grain. A light orange citrus hint as well as a small floral component. That’s about all I got honestly. It was pretty straight forward for the most part. The orange citrus came out a touch more in the flavor. A very solid bitter “bite” accompanied the fruit. An expressive amount of bready/biscuit malt and grain brought about a sturdy footing. Like the aroma, mostly simple and conventional. The mouthfeel was medium bodied. It was somewhat dry, crisp, kind of refreshing and thirst quenching. The carbonation was good and decent amount of flavor was left behind after each gulp. Well. This beer was ok. Nothing crazy or special in my opinion. All in all, just an average beer for me. It wasn’t bad or off putting, but it didn’t really knock my socks off or provide anything to get overly excited about either. It seems to fall a bit short when compared to some of the other Pale Ale’s that are being produced today. I wish I had more to say, but that’s about it really. I’d say give the Bell’s Pale Ale a try if you see it. You may find it to be the one beer you’ve been looking for. Be sure to leave a comment if you sample it. I love to hear a second opinion. Hello everyone. Are you guys ready for another craft beer review? 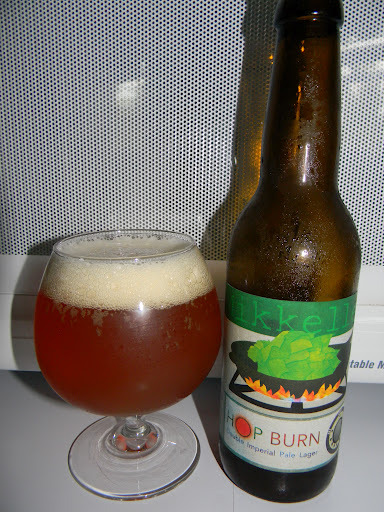 Well, today I have the Hop Burn Low produced by the Mikkeller Brewery located in Kobenhavn, Denmark. The website, mikkeller.dk, didn’t say much about this particular brew. The only place that I could find the commercial description was from a website called, beerpal.com. An Imperial India Pale Pilsner brewed with: water, malt, hops and lagergær. Ok. Not much to go on there, so we will just find out for ourselves I guess. This beer comes in an 11.2 oz. bottle with an ABV of 10.0%. It poured a slightly hazy orange color with a barely off white head. It was sized nicely, kind of soapy and fluffy with big bubbles. The retention time was rather good and the lacing didn’t look too bad either. A noticeable, clear film of alcohol was left on the sides of snifter when tilted. This brew smelled very nice in my opinion. Very fresh and citrusy. Hints of grapefruit and peaches with a distinct resiny and piny attribute. Very sweet and juicy. Light bready malts were found in the background while a sturdy caramel malt and alcohol notes really began to come forward as the brew warmed. The taste brought forth a good dose of that citric goodness. Savors of grapefruit, tropical fruit and pine. The caramel malt seemed to be much more forceful in the taste than it was in the aroma I thought. A pretty strong clear alcohol flavor stood out a touch more also. The bitterness was pretty aggressive as was the sweetness. Any sort of breadiness was pushed to the side by the caramel malt and hops. The mouthfeel was medium bodied. Very dry, sticky, chewy and quite smooth. The carbonation was of medium strength. A significant burn was felt for the first few sip, but it quickly settled to a welcome warmth as I became used to it. A lot of flavor was left behind after each sip as well. Overall, I thought this was a pretty good brew. It was a touch sweet and bitter, and that may deter some, but for the most part I found it to be rather enjoyable. I, personally, thought the beer smelled better than it tasted. Now, that’s not saying that it tasted bad or anything, but simply that the aroma seemed to be a touch more balanced and even. 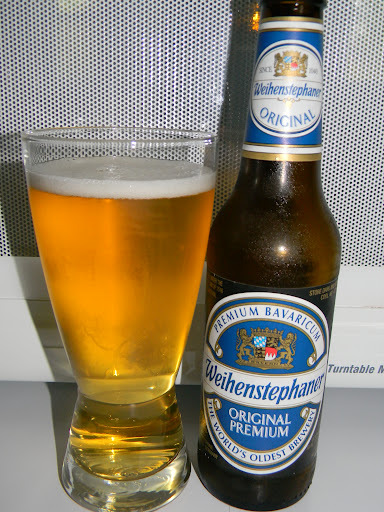 The drinkability was about what could be expected from a 10.0% beer. In other words, I mostly sipped it for the duration. All in all, I’d say that if you see the Mikkeller Hop Burn Low at your bottle shop, pick it up and give it a go and see what you think. Be sure to leave a comment and let me know your opinion if you have a minute or two.